If there’s any food that says “summer,” it has to be watermelon, right? There may be nothing that tastes better on a hot, dry day than a juicy red slice of watermelon. Most of us can relate. But this juicy fruit isn’t just about refreshing a parched throat. Watermelon has a number of health benefits that you may not be aware of. 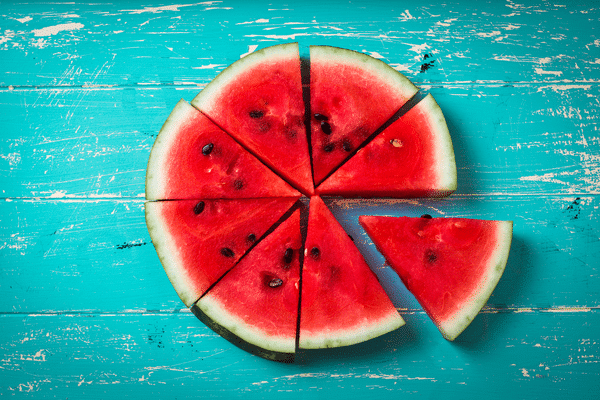 We have a tasty recipe for “watermelon pizza” and once we fill you in, you can read all about the health benefits. Don’t be surprised if you feel compelled to get a few more of these melons on your next trip to the farmers market. We got this recipe from recipe creator Gina Homalka over at Skinnytaste.com. It looked so delicious we had to share it. Let us know what you think! Slice the widest part of a round watermelon in half. Lay the flat side down on a cutting board and cut a 1-inch thick slice from each half. Cut each half into 4 wedges. Place them on a round dish like a pizza and top with cheese, olives, balsamic glaze and mint leaves. Journalists went crazy with the headlines. “Watermelon May Have Viagra-Effect,” one read. “Watermelon Juice, ‘Nature’s Viagra,’” read another. The hoopla came from a 2008 study out of Texas A&M University. Researchers there looked into watermelon’s phyto-nutrients, which include healthy antioxidants like lycopene, beta-carotene, and citrulline, which scientists found helps relax blood vessels, much like Viagra does. “The more we study watermelons, the more we realize just how amazing a fruit it is in providing natural enhancers to the human body,” said Dr. Bhimu Patil, director of Texas A&M’s Fruit and Vegetable Improvement Center in College Station. Arginine boosts nitric oxide, which is the same thing Viagra does. The result is blood vessels that are more relaxed and better able to allow greater amounts of blood to flow through them. Though this effect can help treat erectile dysfunction, it can also help treat high blood pressure and other cardiovascular problems. In fact, researchers found evidence linking watermelon to heart health in 2012. A study out of Purdue University and the University of Kentucky reported that mice fed a diet including watermelon juice had lower weight, cholesterol, and plaque in their arteries than those who didn’t receive the beverage. In an earlier 2007 study, researchers reported that watermelon juice reduced fat accretion, lowered blood sugar levels, enhanced heart function, and improved blood vessel function. Another 2012 study reported that watermelon extract helped reduce blood pressure and improved function of arteries in obese middle-aged adults with prehypertension or stage 1 hypertension. A 2013 study also found that watermelon juice and/or citrulline extract helped to reduce the recovery heart rate in athletes after working out, and also helped reduce muscle soreness. How’s that for an impressive list of benefits! Do you have any watermelon recipes you’d like to share? Let us know in the comments below. Green Med Info – Watermelon juices (and/or L-citrulline) help to reduce the recovery heart rate and the muscle soreness after 24 h.
Green Med Info – Watermelon extract supplementation has a beneficial effect on arterial function and blood pressure. Green Med Info – Watermelon pomace (rich in citrulline) significantly ameliorates the metabolic syndrome in diabetic fatty rats. Have made something very similar to this but watermelon was cubed and tossed in a bowl. This looks like a more elegant presentation. May sound weird, but is delicious. My husband, who won’t eat plain watermelon, loves it. Another variation calls for a bit of diced red onion. Expand your horizons! Sounds great, but my skin doesn’t get along with dairy. But always love pairing fruit with something a little salty or bitter. Sometimes I sprinkle a little pink Himalayan salt on my watermelon…tastes great and helps with hydration. And it’s funny, for years I thought watermelon was just a lot of sugar. It’s so exciting to hear that something so tasty has so many health benefits. I love to make a drink of watermelon, mint, coconut water with lime juice and drink that daily… if I can’t drink it all in 3 days I put the juice in mason jars and pop them in the freezer, I just leave a little room at the top, so it doesn’t explode in the freezer. My niece loves to drink that combo at her soccer game, so I may add a pinch of pink Himalayan sea salt. Nancy, your drink sounds amazing. Do you put it in the blender? Watermelon is very nutrition but….I am sorry but this is just really poor food combining…. Fill vitamix with fresh watermelon chunks. Add just a little ice. Purée. Enjoy!!! It’s way more amazing than it sounds. Watermelon is also 90% sugar…..